White rice is the most commonly consumed type of rice eaten all over the word. But brown rice is gaining popularity in some Western countries due to its health advantages. White rice is essentially brown rice that has its outer layer removed. However, it's those outer layers that contain most of the nutrients. As a result, brown rice retains more fiber, protein, fat and nutritional benefits including helping you reduce the risk of many chronic conditions. Find out more about the exact nutrition breakdown of different types of rice on MyPlate. Short-grain rice is almost oval in shape and very starchy, soft and sticky when cooked. It has the highest content of amylopectin which makes the rice clump together and ideal for sushi, paella and risotto. Medium-grain rice has an elongated shape. It is more tender than long grain rice and used mostly in the production of cold cereals. Long-grain rice is the most popular form and accounts for about 75 percent of rice consumed. It contains less starch, so the cooked grains are fluffy, drier and separate easily. Brown rice is also available in long and short grains. Since it is the least processed, the grain conserves its bran layers , which are rich in vitamins and minerals. Brown rice is a lot chewier than white rice and takes about twice as long to cook, although quick-cooking and instant forms are available. Brown rice can come in a variety of shades: brown, black, reddish or purplish. Enriched white rice has minerals added, including thiamin, niacin, folate and iron, to replace some of the nutrients lost from refining and milling. Converted rice or parboiled rice has been soaked and steamed under pressure, then dehydrated, which forces nutrients into the remaining portion of the grain. Enriched parboiled rice is similar to the nutritional content of regular white rice. Converted rice takes longer to cook than regular rice. Instant rice takes five minutes to prepare because it has been precooked, then dehydrated. It is usually enriched but has a different texture than white rice. 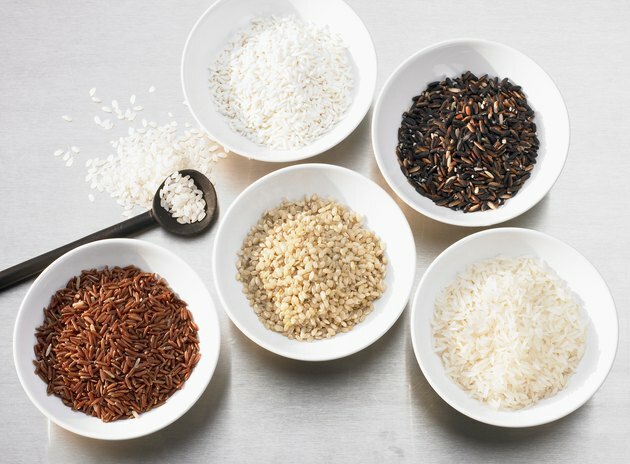 Specialty rices are long-grain varieties that have been cultivated to bring out distinctive flavor profiles. Some of these include jasmine, basmati, Arborio, black and red rices. Brown rice is a whole grain. It contains both the germ and the bran part. White rice has the bran and the germ stripped off by milling and polishing. To compensate for this, manufacturers sometimes enrich white rice before it's packaged. All types of rice consist almost entirely of carbs, with some protein and practically no fat. When you compare 1 cup of brown rice calories to 1 cup of white rice calories, you see there's only a small difference of 43 calories. Brown rice has a significant advantage over white rice when it comes to nutrient content, including vitamins, minerals and fiber. Brown rice is much richer in folate, with 18 micrograms per cup, compared to 5 micrograms in white rice. Folate is particularly essential to pregnant women to protect babies from brain and spinal birth defects. B vitamins are important for the proper function of your nerves, muscles and heart. Compared with white rice, brown rice has a higher content of B vitamins: more niacin at 5 milligrams, or 32 percent DV, compared to white rice at 0.6 milligram; more thiamin at 0.36 milligram, or 24 percent DV, compared with 0.03 milligram in white; and more pantothenic acid, riboflavin and vitamin B6. Brown rice contains vitamin E, important to your immune system, and vitamin K, needed by your body for proper coagulation of blood. White rice does not contain either of these nutrients. Both brown and white rice are good sources of manganese. Brown rice contains 98 percent DV; white rice provides 37 percent DV per cup. Manganese helps metabolize cholesterol, carbohydrates and amino acids and is required for the formation of your bones. Brown rice has a fair amount of magnesium, providing 20 percent DV in just one cup, while white rice offers 5 percent DV. Magnesium helps regulate your blood pressure, build bones and is needed for muscle contraction. Phosphorus is important for your teeth and skeletal structure in addition to transporting nutrients in and out of your cells. Brown rice offers 21 percent DV of phosphorus, compared to 7 percent DV for white rice. Brown rice also contains more iron, potassium, copper, iron and zinc than white rice does. However, white rice has more calcium than brown rice: 16 milligrams, compared to 6 milligrams per cup in brown. Calcium builds and protects your bones and helps with muscle contraction and nerve impulses. Brown and white rice contain the same amount of selenium, with 12 micrograms, which supplies 17 percent DV. Selenium is an antioxidant that helps regulate thyroid hormone activity. Because brown rice retains its bran layer, it is a superior source of fiber compared to white rice. With each cup, brown rice provides more than five times the amount of fiber than white rice. Fiber is essential for the health of your digestive system. Dietary Guidelines recommends that adults get between 25 and 30.8 grams of fiber every day, depending on age and gender. Brown rice contains two types of fiber: soluble, which can be dissolved and may help lower blood glucose and cholesterol levels, and insoluble fiber, which your body cannot break down or absorb. Insoluble fiber remains intact as it moves through your digestive system, taking with it digested food. This creates bulk that can help prevent constipation by softening your stool and increasing its size. Fiber can also help relieve diarrhea by absorbing water and adding bulk roughage to your loose stool. As with other whole-grain foods, the fiber in brown rice can help you stay healthy in many ways. Fiber can aid in the management of your cholesterol, reduce heart disease, balance your insulin levels and decrease your risk of developing diabetes, according to the Harvard T.H. Chan School of Public Health. Keeping your blood sugar and insulin levels stable is a big benefit if you have diabetes. Brown rice is better than white rice for helping to manage blood sugar. The fiber in brown rice can effectively slow your digestion making it less likely you will have spikes in your blood glucose level. By replacing white rice with brown rice, you may reduce your risk of developing diabetes. A study published in Nutrients in 2018 suggested that two to three daily servings of whole grain, such as brown rice, may result in a 21 to 32 percent reduction in the risk of developing Type 2 diabetes. On the other hand, high consumption of white rice has been linked to an increased risk of insulin resistance. A systematic review that examined 16 cohort studies found consumption of brown rice had a protective effect on risk of diabetes. However, white rice had the opposite effect. The conclusion, published in the European Journal of Epidemiology in 2013, recommended at least two servings per day of a whole grain, such as brown rice, to reduce Type 2 diabetes risk. Read more: Is Steamed Rice Healthy for a Diet? How Is White Rice Healthy for Our Body?